First, marinate your bacon in Frank’s Hot Sauce. Marinate at least 30 minutes before you will cook it. Cook your bacon on medium low in a cast iron skillet. While your bacon cooks, blacken your jalapenos over the open flame of your gas stove. You could also use a torch if you’re feeling fancy. You want the jalapenos blackened and crispy all over! After they’ve cooled, scrape the black crust off and chop into coins. Remove seeds and ribs. Chop your beautiful, local heirloom tomatoes. They are really the star of this dish. 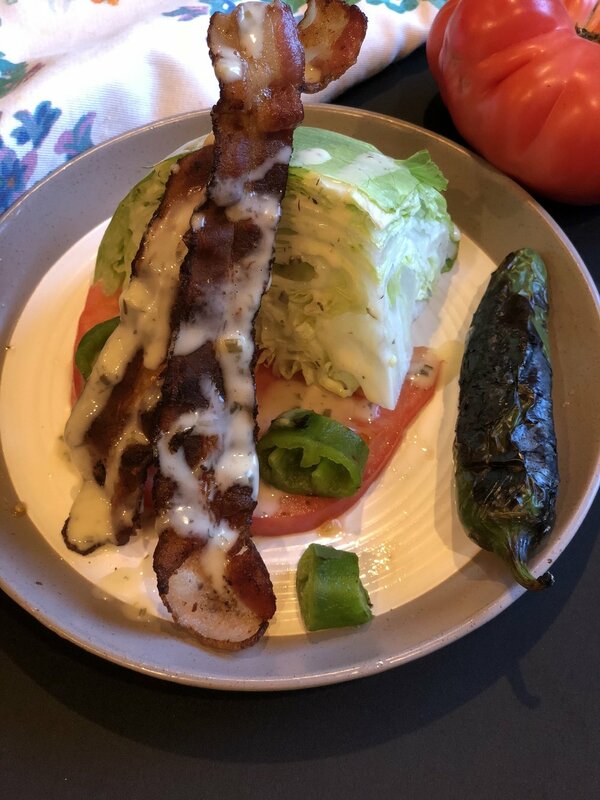 If you’re making a wedge salad, cut your lettuce into wedges and layer bacon, tomato, and jalapenos. Pour ranch on top. If making a chopped salad, chop up your lettuce. Chop up bacon. Mix all ingredients up in a bowl and top with ranch. I use this one. Pour hot sauce on bacon and let marinate at least 30 minutes. Fry bacon on medium-low in a cast iron skillet and drain on paper towels. While your bacon fries, blacken jalapeños over gas stove open flame. Turn until all sides are blackened. Let cool and then scrape off crust. Chop into coins and remove seeds and ribs. Chop lettuce. Combine all ingredients and top with Ranch dressing and fresh black pepper.